FC2 is pleased to announce the release of our newest Blog Feature. 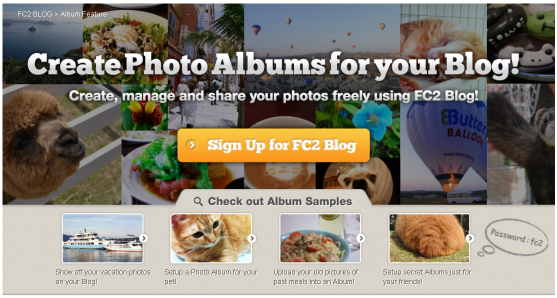 Now when you upload pictures to your FC2 Blog, you can also put them inside an album. This way, all your pictures can be viewed from a single page. The new FC2 Album Feature has the following cool features! - Display all your pics from a single page! - Manage multiple albums from a single account! - Set passwords on your albums for privacy. - Bulk upload your pics into the album of your choice.